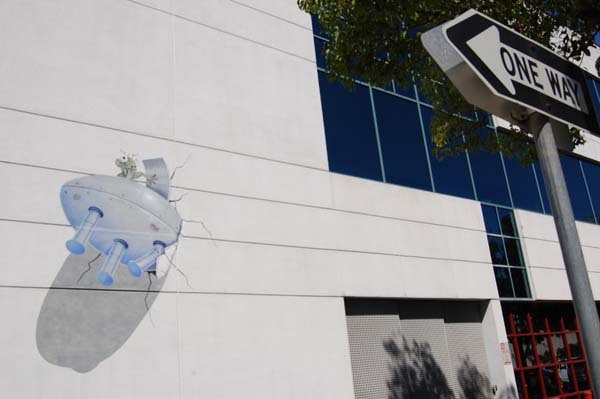 Alien Crash Trompe-l’Oeil Mural in Palo Alto, Calif.
Joe the Truck is 10 years old. When we left on Road Trip 2013, he had 165,000 kilometres on him. How old your car is should not matter. I have his oil changed every 5,000 kms (he had four in 2013) and take care of minor issues quickly, because when I hit the road, I don’t want maintenance fears in the back of my head (I want them to sneak up and say BOO. Sigh.). Three weeks before we started west, I had a full inspection done on Joe and fixed several little things. What I did not do—and still have not done, for fear of what I’ll find—is have the spare tire checked. I have CAA Plus, which I didn’t need at all during our trip but, as faithful readers remember with a grin or grimace, I needed quite desperately during that Vermont drive in October. Everyone wants to know how we can possibly afford trips like this. Seriously? Road-tripping is cheap if you do it right. We’ve never spent more than $5,000 on a summer trip, and most of that comes from money we get from our tax returns. We really wanted to see Portland, but for all of us to fly there, get a hotel for, say, two weeks, then rent a car so we could see a tiny bit of Oregon, would have cost us more than our entire month-long trip—and we saw a helluva lot more than Oregon. We stayed with friends along the way, which not only cut out more than a week’s hotel bills, but brightened our trip more than I can ever thank them for. $50/day in gas (nearly nothing when with friends, up to $65 on big driving days). Gas is cheap state-side, especially in the Midwest. $75/night for hotel, minus 10 nights with friends and five free hotel stays (I’ll get to that). $60/day for food. This is the cost that fluctuates the most. Breakfast is included at most hotels and the staff at the friendlier places slip you an extra orange or waffle for later. Breakfast and last night’s leftovers are usually good enough for lunch, so generally one restaurant a day was all we did. 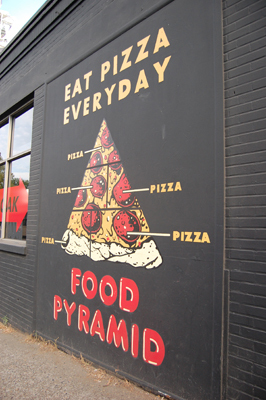 We prefer out-of-the-way, family-run diners, where the food is good, plentiful and cheap. When we can’t find a diner, Denny’s is our go-to chain—we know what we’re going to get and they know how to treat a toddler. We’re not big shoppers. A few souvenirs, bumper stickers, cool finds at vintage and thrift shops. The rest of the money goes into attractions, including an $80 national parks pass that we felt was our best purchase of 2013. 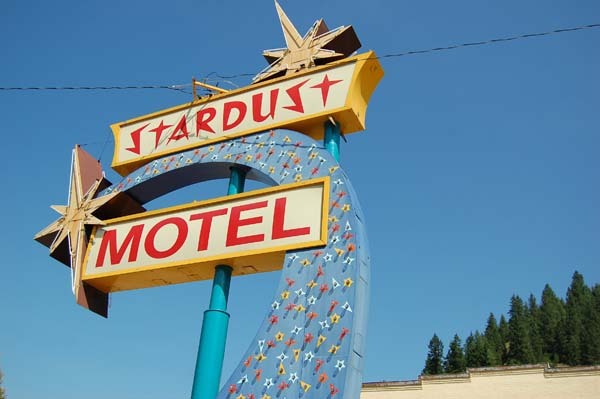 The Stardust Motel in Wallace, Idaho, had a definite Supernatural feel to it. Although we love Supernatural-esque, privately run motels, we stay almost exclusively in Choice Hotels properties. Their Choice Privileges points program runs a promotion every summer where two stays at separate hotels rack up enough points for a free stay at a third hotel. We save up our free stays till the end of the trip, when we’re running out of money. Points be damned, the most fun we had was deciding at the last minute to stay in the Badlands Budget Host Inn in the town of Interior, S.D. There was no TV, but there was a barbecue pit and the Badlands, and more stars than one person can hope to see, ever. 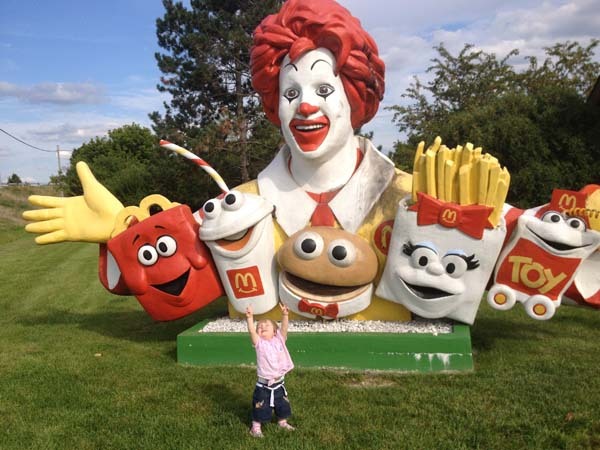 Possibly the creepiest Ronald McDonald ever created, discovered by accident in Ohio. You gotta find that planning sweet spot. You need to have a good idea of the types of land you’ll be crossing, about how long it’ll take you and where those barren stretches with no services are. If there’s an attraction you really want to see, you’ll want to plan to arrive before it closes, and you must allow time for side-of-the-road attractions you don’t know about till you’re right on top of them. You must remain flexible. This isn’t a cruise ship where swing dancing is from 7 to 9 and shopping at a market is 2 to 6. On the open road, be open to the road. We planned to spend two or three hours in the Badlands, but we stayed a day and a half. We planned to swim in the Great Salt Lake, but at the last minute decided we were all too weary and eager to get to our next stop. We’re so open to change, we flipped our entire trip upside down after less than a week on the road. Our plan—in the making for months—was Erie-Colorado Springs-Santa Cruz-Portland-home. South, west, north, east. But the day before we left Erie, the daughter of our Colorado host fell ill. By the time we got to Omaha, Mel had flipped our trip around: we’d head straight to Portland, hit California and meet Melle in Colorado two weeks later. The original first half of the our trip—reservations, attractions, driving lengths—was all Melani had mapped out. From Omaha on, we flew by the seat of our travelling pants and (after a few tears), had one of the best holidays of our lives.